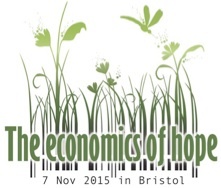 Two hundred people attended the Joy in Enough “Economics of Hope” Conference in Bristol on 7 November 2015 at St Michael’s Centre at St Michael’s Church, at Stoke Gifford, Bristol. 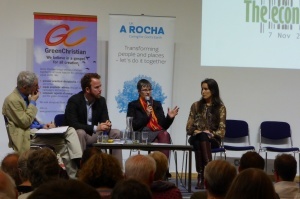 This was organised by Green Christian, with a big input from A Rocha – the two leading Christian “Care for the Earth” organisations in the UK. The morning’s session was chaired by Ruth Valerio of A Rocha UK (far right) who did an excellent job of encouraging people to tweet about the conference. Responding to Paul Bodenham’s call for a ‘good economics’ which would ‘unleash a culture of hope’, Molly-Scott-Cato outlined how an economy not dependent on growth could deliver a richer society. She proposed more equitable ‘globally local’ economies sustained by – and in turn sustaining – the life of their own bioregion. It would be an economy which restored relationships with nature. Jonathon Rowson took the relationship challenge further. He considered it vital that love be restored to our economy, between humanity and nature as well as between people – in contrast to the attitude in a video sketch. But we would also need to confront our culture’s denial of death in order to regain our place in the natural order. Though not identifying as a Christian, he spoke strikingly of how baptism and the ‘very grown-up story’ of Easter would enable Christians to recover their right place in a sustainable economy. The seven afternoon workshops examined aspects of the task ahead, and the final plenary demonstrated a shared determination to build a new, just and sustainable economy. No-one will do it for us, and this where your contribution comes in. Measuring Progress, Gross Domestic Product (GDP) is the dominant measure of prosperity and the driving force of economic policy. This workshop explored alternative measures of progress which take into account societal and environmental wellbeing. Economic Education, Academic economics tends to be dominated by a mechanistic, ‘neo-liberal’ model, with little scope for critical and comparative thinking, or for the vital social and environmental issues that confront us. This workshop explored the challenges for a new generation of economists. TTIP and Corporate Power. The Transatlantic Trade and Investment Partnership is one of a number of ‘free trade’ proposals giving corporations new freedoms. It represents the line of the battle between competing political visions for human well-being. Workshop covered the latest on the campaign against, understanding the arguments in favour, and finding out how it is shaping the movement for sustainable economics. Monetary Policy, explored the possibilities that open up when we understand money differently, and the challenges for a financial services industry that prioritises the interests of workers and consumers rather than bankers. De-marketing explored the extent of the influence of consumer marketing on attitudes and behaviour; the consequences for people and planet; and different approaches to ‘de-marketing’ or restricting the power of the marketing industry. Inequality. The rapidly growing gap between rich and poor is not only unjust but inherently unsustainable. This workshop got to grip with the problem and explored solutions for the benefit of people and the planet. Building a spirited movement for economic change. This session focussed on the journey forward from the conference. 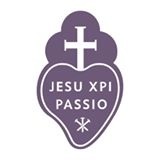 How should the wider church be engaged, what should be the message but first and foremost, how should our understanding of faith and spirituality evolve for such action to be vigorous and authentic?